TronicsZone is one of the best pcb design service providers. We specialize in 2-layer & multilayer highly dense & compact PCB board design and printed circuit board design. We follow best design practices along with an exhaustive quality check list, as a result of which, we have perfected the service to a level where an overwhelming percentage of the designs we deliver are right the first time. 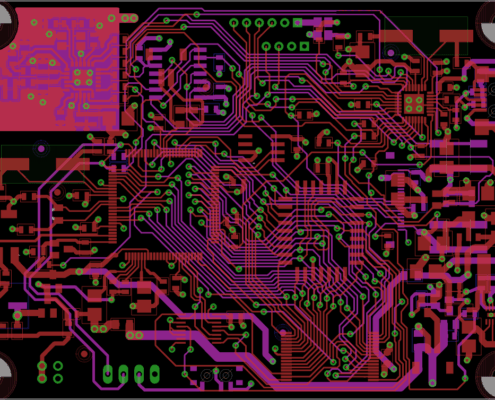 We can also offer eagle pcb design layout as a stand-alone service to convert any existing schematic diagrams that you might have already designed into fully PCB assembly prototype. When you look around, it’s easy to say that electronics play a vital role in our daily routine. One of the key concepts when we talk about electronics is PCB or printed circuit board. As one of the foundations of electronic products, PCB is essentially the heart that gives life to almost all of the modern electronic products we are enjoying today. PCB is basically a manufactured board wherein electrical components are delicately assembled in order to form an electrical circuit. A circuit board connects components to one another through the configuration of a series of related circuits. Consisting of tracks and pads, a PCB connects various points together. It serves as the channel that allows power and signals from the components of the board to be routed between the physical devices. The electrical connections between the surface of the PCB and the electronic components are made possible by drilling holes on the board, placing the components and using a type of metal called Solder. As a metallic element the solder also serves as a strong mechanical adhesive for the materials on the PCB. Your electronic circuit project’s performance will largely depend on how it is laid out or designed on the PCB. 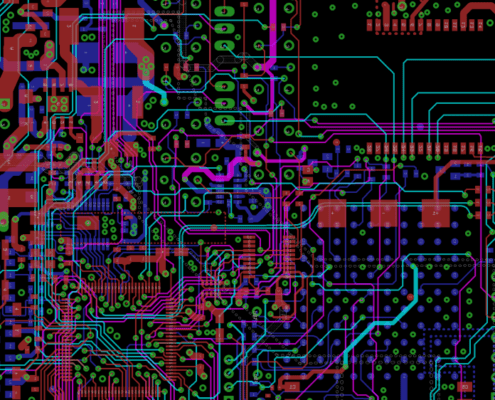 By and large, PCB designing can be a complicated task. By using careful approach in designing your circuit board you can ensure that you develop the right electrical circuit for your project more efficiently and cost-effectively. To start with, before designing your PCB it is important that you create a schematic of your electronic circuit project. The schematic works as a blueprint for laying out the traces and the placement of the components on the circuit board. To make things easier you can use a PCB design software. You can choose from a variety of PCB design software solutions available now such as Eagle, Multisim, EasyEDA and CAD. These software applications feature a library of components that you can use to build a circuit and allow you to make circuit design changes and modifications according to your requirements conveniently. Once you have settled with the software you want to use, it’s time for you to draw the schematic diagram of your project into your chosen software. The next step is to transfer the schematic diagram into a drawing of your PCB. After completing the drawing on your board, check for some errors prior to converting your design to Gerber files. Lastly, choose the PCB manufacturer where you want your PCB to be made. The use and application of PCB spans in almost every industry today and it is continually developing and evolving. PCB works as prototype and essential foundation of the majority of electronic products we use. PCB comes in a wide array of configurations which allows them to serve for a plethora of functions. And, with the right PCB design complex electronic circuits are made possible. As such PCB is widely used in medical devices, smartphones, computers, automotive applications, lighting solutions and industrial solutions. PCBs offer flexible and adaptable solutions for various applications making it valuable across a range of various industries. PCBs have embedded copper tracks. These tracks have proven to be quite effective in preventing short-circuit and related issues. Furthermore, these boards can be tested using a computer before the actual printing takes place. This helps to debug any issue at early stages. There is no further inspection required once a PCB has been designed and printed digitally. There are little to no chances of broken circuits. However, in case if it has been designed and printed manually, there are greater chances of broken circuits; hence, further inspection is required. PCBs are easy to be maintained as there is no case of complex wiring or loose parts. All the components of the board including the layers are fixed in their designated place. In addition to that, its simple design also ensures easy maintenance. If the requirement is to produce a large number of PCBs in the same design, the production cost can prove to be extremely low. Multiple boards can be printed easily and in quick time once the design has been finalized and etched on the board.